I had five sadly aging pears and a couple of starting-to-wrinkle apples on my kitchen counter this morning. A visiting friend of mine, my daughter, and I had just finished our protein waffles for breakfast, lamenting the passing of berry season, when we could sprinkle raspberries and blueberries on our waffles with abandon without spending a small fortune. 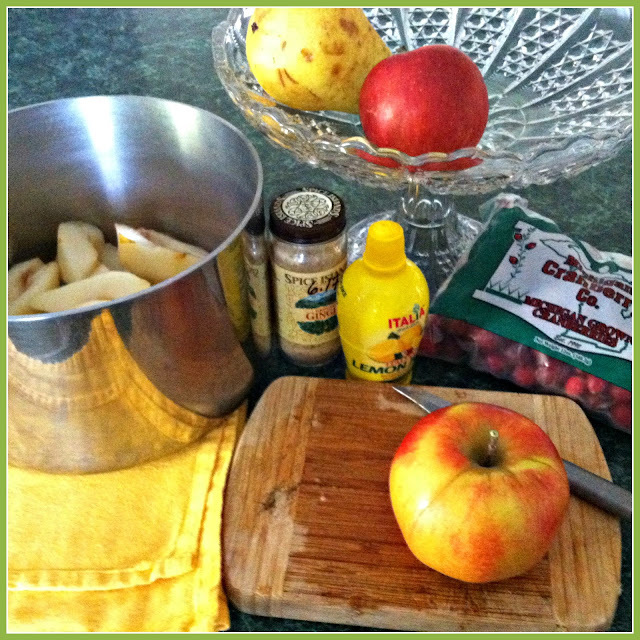 A warm apple and pear compote, perhaps with a few cranberries thrown in, would be delicious on our waffles tomorrow. I chopped up the fruit, added a few cranberries (not too many because I didn't want to add any sugar), some lemon juice, ginger, cinnamon, allspice, and a little water. 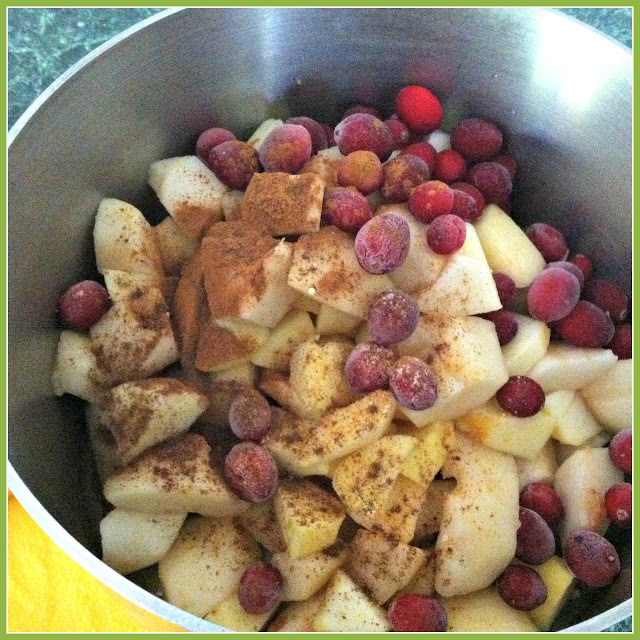 The house was filled with lovely, spicy, homey-cozy smells as the fruit mixture simmered gently. Will taste so good tomorrow morning. It was 30 degrees (F) this a.m., with a thick layer of frost on everything. Comfort is key these days. Speaking of comfort, I've abandoned any notions of being stylish in the evenings around here. After a few years of feeling much warmer than usual (you ladies of a certain age will know what I mean), I am back to my normal, always-cold-in-the-winter mode. I got this robe in blue. It's chenille, and super soft. I love how it buttons. No ties coming undone and gaping openings. It's not super attractive, but when it's 20 below outside, I just want to be warm. It will be so cozy. Thank you all for your kind comments on my hair. I feel encouraged to stay the course! Another two, or three at the most, months, and all the blonde dye will be gone. And I'm re-thinking the idea of growing it out. So many people have told me they like my shorter hair. Who knew? 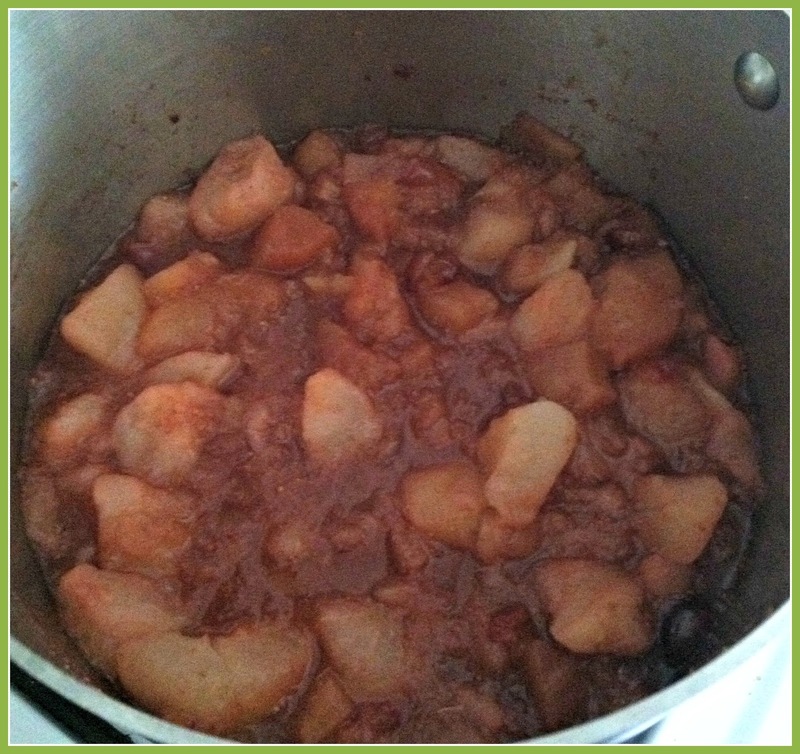 That apple pear compote sounds delicious. I made something similar some long time ago when my own pears and apples were looking abit 'squirrely' and tired. Yum. Your robe looks cozy indeed. You'll be glad you have it when the days turn bitter. I do understand about the traumas of hairdos. Perhaps as women the reason we feel that so intensely is that our hair is to be our 'crown of glory'. Hairstyles sometimes don't let us 'feel' that way. But I must say that I like your new look, even if you're not sure yet. I have done that little smile thing too when I've needed an inward boost -- it really does make a difference. Wishing you a beautiful one. Enjoy the compote. And the dancing lessons. Hubby and I have that on our list too. Before next summer. I bet your home smells wonderful and the compote will be delicious! Comfy looking robe. Mmm, your compote looks wonderful, Deborah, and on waffles; yum! The fluffy robe is a nice one and I like the buttons too. Enjoy the dancing lessons. Thank you for joining with me again today. Hope you have a lovely week. That compote sounds wonderful! I often make a berry sauce (blueberry, raspberry, strawberry or a combination) with frozen berries to serve over waffles. My granddaughters love the strawberry sauce in particular. But I love that you made this with no sugar. Must try it! Thanks for sharing. So smart to use your fruit like you did. I imagine your house smells yummy and breakfast will taste extra good tomorrow. Oooh ... I may need to buy one of those robes. The buttons sold me. (well with again apples, as hubs never lets a pear grow old haha) and put on French toast now and then. Don't forget a little Splenda in there with cranberries always sweetens without true sugar too. I think your robe must be very pretty. And I love robes that button, no zippers or ties please. And I love your frugal use of the pears and apples. These spices are what I want this time of year. I'm going to go back and check out your hairdo post now! Don't you just love protein for breakfast? The addition of the compote would add just the right touch of sweetness. The robe looks so cozy, Deborah! My youngest son and DIL gave me a really soft, fluffy robe several years ago and it's so cozy and warm. When I wrap myself in it, I feel their love. I think the robe is cute in an old-fashioned way and you know I love that. You hair looks great. I think those ladies were just jealous. Hi Deborah, what a delicious compote you made. I can imagine the wonderful aroma filling the air in your home. I love your cozy robe and the style of this one. I too love a robe that is straight down without a belt to tie. It's about the warm cozy feel being inside during this nesting season. You had some cool temps already. We are still around 70 during the day but drops to upper 40's or 50's over night. Better then 102 any day. Enjoy the week and stay warm. Just this week after I'd baked us some waffles with raspberries, blueberries and Canadian maple syrup, I was discussing with my baby-sister the availability of raspberries and blueberries here at Costco, year-round. They come from Chile when they're not being produced in the USA. She said they only had them for a brief period, when produced fresh and only frozen for the remainder of the year. I mentioned to her the economical way of using seasonal apples, pears and such. She said I will be doing that next! Here you too pondered about it and made some delicious and healthy waffle topping. Only the smell of those spices makes one warm. You are so right about dressing warm and I too have mainly cold hands in the evenings, just like in my younger years. Enjoy being cozy and snuggle up the way you want to. Comfort always takes precedence for me. It's always freezing at the office so my co-workers and I would joke about working in our cozy robes and snuggies...and yes, I'm wearing my snuggie while I'm reading this post! Thanks for posting the link for the robe. I hate the way tie robes never stay on and the only alternative I'd found, a zipper robe, was pretty thin and poor quality. I'm going to order one of these and be cozy! Thanks. The compote sounds delicious and perfect for warming up on a cool day. I also like the robe...it looks very cozy. I'm sure you'll not only be warm but will look stylish too. Oh, and I think your hair looks great! Now that I am back from my holiday, the growing out of the dye will commence. I have already had a lot of my hair cut ready. You are an inspiration. The combo sounds perfect for a cool day.I'm so in the mood for the holidays.Thank You for the reminder of an old favorite of Mine,slow cooked pears. You are so right: cozy is key, and I love the details of the chenille robe, especially the button down practicality. I love your new haircut!! It really suits you, as does the colour. Kudos for keeping it real! The fruit compote sounds so nice to go with the waffles. I like that bathrobe too. Good luck with your hair. The cut is very close to the Meryl Streep photo. Since you have similar bone structure I think its a good choice and your hair dresser should be able to make it happen. I use Silver Lights to brighten my hair, and Aloe Rid to get the yellow out. A smile makes everyone more attractive. Happy girls are the prettiest!